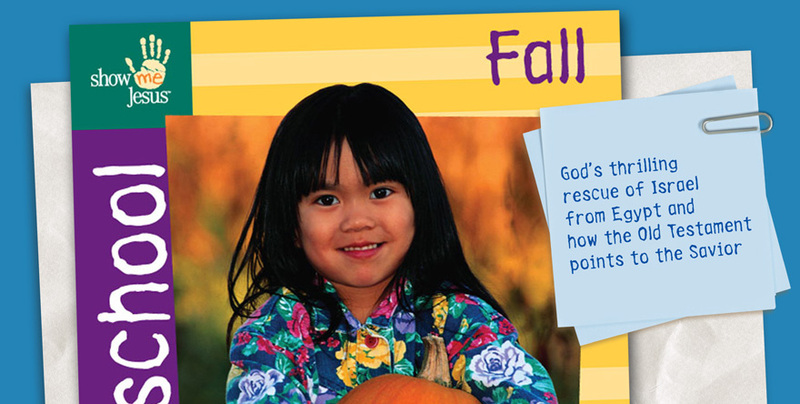 Welcome to the Fall quarter of the Show Me Jesus curriculum for preschoolers. For 13 weeks this curriculum will focus on the theme God Leads His People. Children will discover that God calls his people to himself, and he wants them to trust and follow him. Through exciting Bible stories about Moses and the Israelites, preschoolers will begin to grasp that God is loving and powerful, he makes and keeps promises, he punishes sin, and he redeems and saves his people. Unit 1 focuses on the fact that God prepares his people. The first three lessons show how God called Moses and sent him to lead the Israelites out of slavery in Egypt.In Unit 2children learn that God saves and protects his people. God showed his power to the Egyptians and Israelites, saved his people from death, and led them safely away from Egypt. Unit 3 highlights how God provides for his people.Preschoolers discover that God did not abandon his people as they traveled through the wilderness. He gave them manna and quail to eat, he provided sweet water for them to drink, and he protected them from their enemies.In Unit 4preschoolers are taught that God keeps his promises to his people. He made a covenant with the Israelites at Sinai, promising to be their God as they served him faithfully. The Israelites broke their promise to obey. And although he punished them, God did not turn away from his people; instead, he forgave them and led them on to Canaan, the land he promised to give them. Interwoven throughout the quarter is God’s promise to send the Savior. Preschoolers learn that God sent his Son, Jesus, to save his people from their sins. They learn that those who trust the Lord Jesus as their living Savior can be sure of forgiveness of sins and help to follow God’s leading. Why do your children need to study Pilgrim’s Progress? The Gospel Project is a Bible study resource that invites Students, to dive deeply into God's story of redemption through Jesus Christ. In every lesson, participants are immersed in the gospel and learn how when the gospel works on them, they become a part of the story, too, the very hands and feet in God's gospel project.